The Large Salmon Egg Clusters come with 10 egg clusters per pack. This is an Artificial Roe bait that is LOADED with REAL Shrimp & Roe scent and other natural ingredients that we have kept a secret (we can't give away all of our tricks). Not only do we package these baits with scent, they are also infused with scent during the manufacturing process. This double scenting truly sets our baits apart from the competition and gives our customers a serious advantage. Loved this product! Caught a steelhead with second cast using these! I've used these on the Cowlitz River several times. Caught several nice fish when my fishing partner, using real roe, didn't. Love the product. 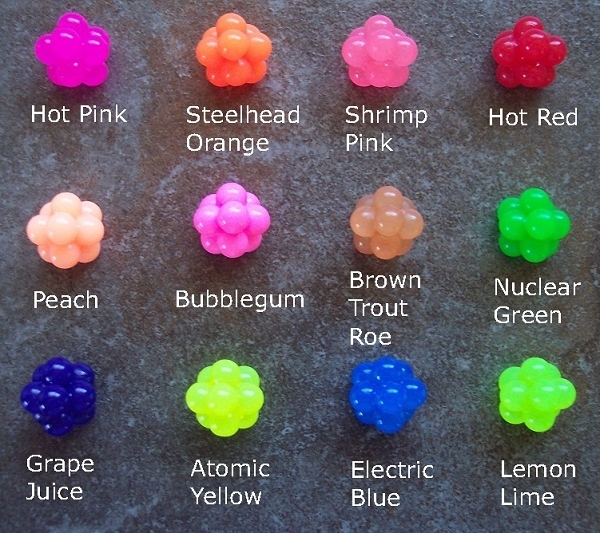 Bought these artificial egg clusters from their online store. Tried them a couple weeks back on the mad river near arcata, ca. Encountered muddy river conditions, only had one bite (I think that had more to do with the terrible visibility) anxious to try them in better conditions, they look very real. 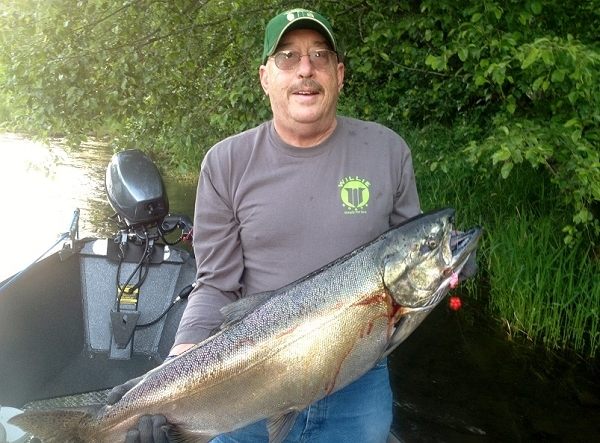 Q: I am really stuck on if I should get the large or the medium size for winter steelhead . the medium seems small but the large seems to big. Can you help me out? A: In general, the mediums are more popular for winter steelhead then the large. They are about the size of a penny and on the average size river, like the Rogue River in Oregon they are perfect during normal winter flows. 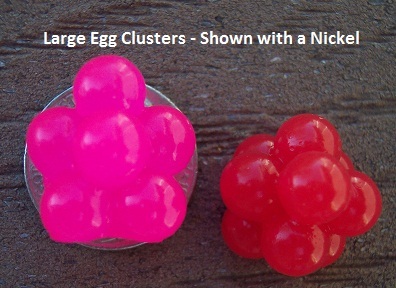 The large and mini eggs have their place in winter steelhead fishing as well, depending on conditions. Without knowing where your fishing it would be hard to say which would be a better choice for you. I personally use the medium and the mini's on the Rogue, Umpqua and Applegate Rivers (if your not local that probably means nothing =) ) here in southern Oregon but I do use the large on occasion as well. If you want help pinpointing size and color you could always call us, chances are we've shipped to your area and already have a good idea of what works best. Q: I really like the picture of the eggs on the hook shank. Could you tell me what I need to buy to recreate it please? A: Hi Alex, That rig is for King Salmon, it's a Large Hot Red egg cluster, a Bait Button and a 2/0 octopus style hook (Gamakatsu or Owner is fine). Hope this helps, let us know if you have any other questions. Thank you for your interest in our egg clusters! We would be happy to set you up with wholesale prices for our egg clusters. Obviously, the more you buy the better the price. I'll send you an email and we can talk about how our wholesale program works. Thanks Matthew, we look forward to working with you.